What's the name of these two surfaces? I've plot two implicit surfaces which are shown in the above, I only know their expression, but I don't know how to call them. 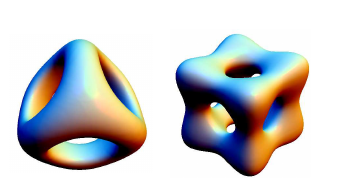 The second one appears to belong to a family of surfaces defined by Banchoff based on the Chmutov surfaces of order $n$. Explicitly, the implicit equation is given by $$3+8(x^4+y^4+z^4) = 8(x^2+y^2+z^2).$$ The first one is not known to me. It appears to have a tetrahedral symmetry. Not the answer you're looking for? Browse other questions tagged multivariable-calculus algebraic-geometry surfaces visualization or ask your own question. What's the name of the surface and Is it a $C^2$ smooth surface? What is the word associated with the connected sum of two surfaces with boundary?